This delightful vacation home is a new 3 story, 3,000 square foot townhouse, decorated with an array of beautiful adirondack style furniture, pictures, and more. The mountain views from the large deck are spectacular. One can easily spot Gore Mountain and all of its surrounding scenic landmarks from this deck. 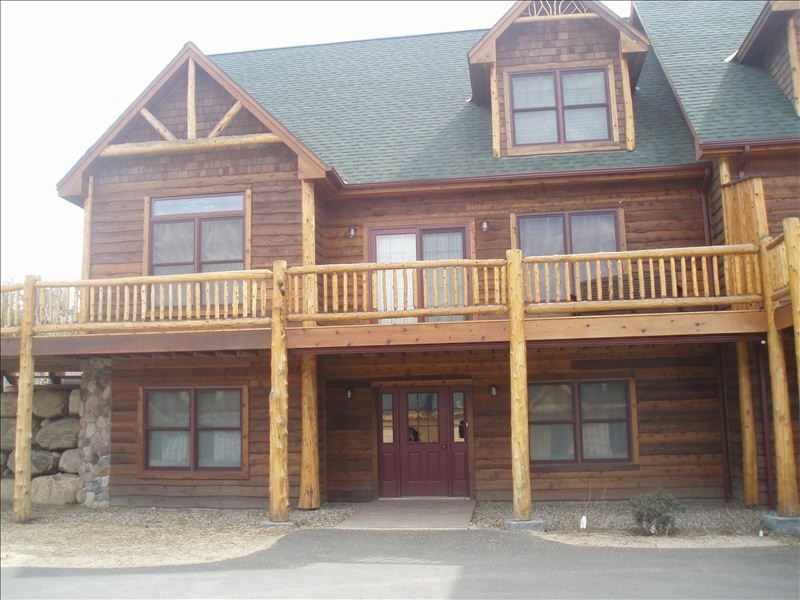 This adirondack themed house includes 4 bedrooms. The master bedroom comes with a comfy king bed and a full bathroom (shower/bath, sink, toilet). The second bedroom comes with 2 bunk beds (4 beds total), a great place for 4 friends to sleep in the same room. This bedroom includes a full bathroom right across the hall. The last 2 bedrooms come with a queen bed and single bed each, and are both located across the hall from a full bathroom. The basement, where you walk in, includes an area to take off snow gear and a place to put your shoes so they are out of the way. This area also comes with a coat closet. This is a great place to bring your family and friends. This townhouse sleeps 12 people easily, enough for a large group of friends. All of the activities here can be done in a group, and why not have fun with your friends while doing them? Then after a long day, you and your friends can jump into a nice bubbling hot tub filled with super powerful jets that can even massage your back and neck if needed. This home is located only one mile from the access road to the Gore Mountain ski facility, where you can do many winter and summer activities. The most popular winter activities include skiing, snow boarding, and cross country skiing. Snow tubing, which the kids will love, is also nearby. Although it may seem that Winter is the only season to have fun, Summer, Fall, and Spring are full of activities to do with your family and friends. These include white water rafting, which is quite an adventure; hiking, which includes trails for all levels of hikers; and mountain biking, which can be done on Gore Mountain, just 1 mile away. One key amenity is our the hot tub. But not just any old hot tub. This private, sizzling hot tub seats 8 people and includes many powerful jets. During the winter this hot tub is perfect for relaxing after a long day of skiing, snowboarding, or any other cold winter activities. This luxurious tub is also great for late night tubbing, as it comes with multiple colorful lights that can be set to your personal preference. Some people are even daring enough to roll in the snow before jumping into the 100 degree tub (temperature can easily be modified to your liking). Maybe that will be you? I chose this location mainly because of the many fun activities to do all year round. The excitement is certainly not limited to just the winter. Activities such as white water rafting and hiking make this the ideal vacation spot. Additionally, this lovely vacation townhouse is just 5 minutes away from Gore Mountain, a wonderful ski facility, where people of all ages can ski, snowboard, and snow tube down a snow-packed mountain. 3 full bathooms located on level one, main level (in master), and level three. Also a half bath on the main level near the living room. The quaint Adirondack village of North Creek is 2 miles away where you can find shopping, restaurants, and a great wine bar. The property is big and open and obviously newly built. There was not a single ‘musty smell’ which we often find with rented mountain houses. The many mattresses and pillows were very comfortable and there was more than enough space to accommodate our group and ALL the stuff that comes with skiing with adults and kids. The house has three floors which was great for a group that doesn’t all go to bed at the same time. Plenty of ‘hang out’ spots and a perfect large table for meals and games. The hot tub was a perfect addition after a long ski day. I’m very picky about hot tubs I’ll go in and this one was clean and well cared for. Many of the rentals near Gore are 15 or more mi it’s from the mountain. This property is 1 mile! Robert the host really cares about his property. When we arrived we could tell there had been an issue and the home hadn’t been cleaned since the last renters checked out. We contacted Robert and he was very surprised and immediately interested to know the state of the condo and even asked for pictures so he could address it with the cleaning company. We were able to do some laundry and get it back in order quickly but Robert was there to help if we had needed more. We were sad to leave today and can’t wait to go back. We wouldn’t stay anywhere else for a trip to Gore. This was a perfect space. We have three families and stayed very comfortably. Convenient location, beautiful views. Large general areas and well thought out bedrooms. Kitchen had everything we needed and more. Plenty of space to entertain and quiet areas to get away. Basement entry area was great with plenty of space of ski gear with a large group. Owner was awesome and very responsive to questions. Really enjoyed the townhouse, it is even larger than it appears in the pictures. Everything was clean and the house was well stocked. Wonderful cabin in a beautiful location! We had a wonderful time at this cabin. It’s in a beautiful location and has plenty of room. It is the perfect getaway spot to view the mountains and to relax in the outdoors. The cabin is beautifully decorated and really makes you feel at home. The rooms were spacious and the beds were more than accommodating. The kitchen and dining room were immaculate and everything has been taken care of really well. We made good use of the deck overlooking the landscape and nestled in the foothills of Gore Mountain. It was the perfect place to sit and have coffee in the morning. The hot tub was perfect as well and added for a nice relaxing way to end the day. We also used the grill and had a wonderful meal. Everything is in great condition and worked very well. I would highly recommend this place to anyone looking to escape for a few days. It is perfect for families or large groups and is not far from Lake George, Gore Mountain or any of the other scenic attractions in the area. I would absolutely return to this property in a heartbeat. Thank you very much for having us! Newer, clean, spacious home. Great setting. The owner was very attentive whenever I needed to get ahold of him. Great home for larger groups, we had 4 adults and 8 kids and there was plenty of room for everyone. Beautiful setting, small town a couple miles away for any of our needs. If I were to vacation to this area again, this is the home I would stay in, no questions! Rates are subject to change at any time until reservation is confirmed. Weekend only stays are higher than the weekly rate dividend by 7 days. Special pricing is possible for longer stays.